Contemporary art is the art of today, and is defined by our experience of it. Even if we don’t think we know anything about art, we can all consider the idea of a work, react to how it looks, or wonder about how it was made. The study and interpretation of contemporary art is an ongoing conversation related to the questions and issues of our time. GlassApp is full of these conversations. 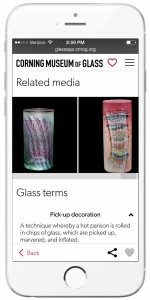 A free, responsive mobile web app, GlassApp (http://glassapp.cmog.org/) was launched by The Corning Museum of Glass for the opening of the Contemporary Art + Design Galleries in March 2015. Explore Glass features photos, artist biographies, and video interviews with Museum staff members that highlight current conversations in art, craft, and design. Each artwork in GlassApp is paired with the artist’s biography. Written in a conversational voice, the bios reveal little-known stories about the artists. Related media shows photos that help put the artwork in context, as well as other works by the artist, and Glass Terms define techniques and other glassmaking terms. GlassApp has 4 main sections: Explore Glass, Architecture, Today at CMoG, and Social. Explore Glass features photos, artist biographies, and video interviews with Museum staff members that highlight current conversations in art, craft, and design. Every video is closed captioned and has a full transcript. Learn about the design of the new galleries and of the Museum’s campus under the Architecture section, and find up-to-the-minute information on what’s happening at the Museum under Today at CMoG. And finally, join the conversation on Twitter or Instagram using the hashtag #GlassApp. See posts in real time under the Social section. Since launch, over 858 photos have been shared with #GlassApp on Instagram, and even more posts on Twitter. Users can save objects in GlassApp by tapping on the heart in the bottom right corner of each artwork screen to add the object to their “Love It” list. Love It lists do not require a login and are saved by users’ session. Users can share objects or their Love It list via email, or post to Facebook, Twitter, Pinterest or Reddit. Onsite visitors can easily access GlassApp by simply connecting to the “GlassApp & Free WiFi” network in the Museum. An initial screen prompts to connect and proceed to GlassApp. In the galleries, benches with iPads connected to GlassApp are available for visitors who do not have personal web-enabled devices and would like to access additional information about the works on view. On two ends of the galleries, large screens display the #GlassApp social feed and a video introduction to GlassApp. Offsite users can access GlassApp by visiting http://glassapp.cmog.org in the web browser on an iPhone, Android, other mobile device, desktop, laptop, or tablet. 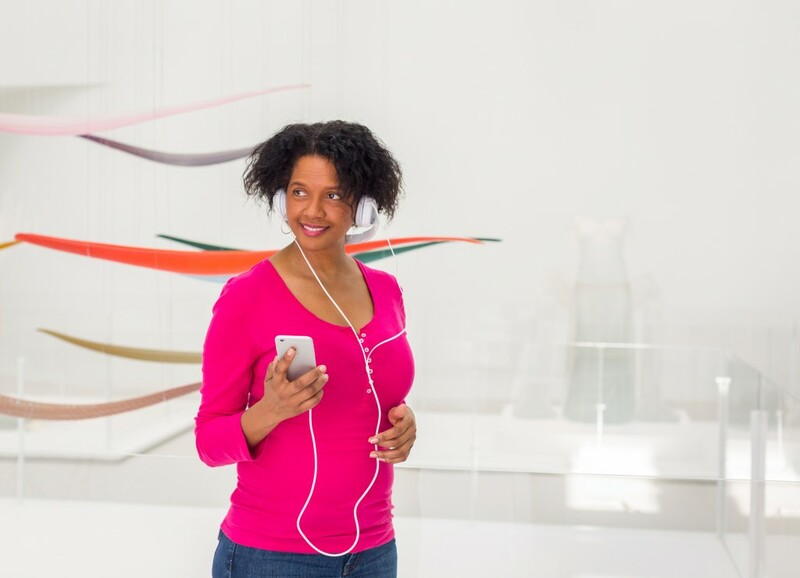 In conjunction with the launch of GlassApp, the Museum developed an overall bring your own device (BYOD) strategy (Sayre, Bring it on: Ensuring the success of BYOD programming in the museum environment, 2015), conducted a visitor preparation survey, and installed 40+ charging stations. GlassApp is a component of the campus-wide initiative of The Corning Museum of Glass to integrate all forms of interpretive information to enhance the visitor experience. Find content on the Contemporary Art + Design Galleries in the current release of GlassApp. Future releases will include more galleries throughout the Museum. A free, responsive mobile web app, GlassApp was launched by The Corning Museum of Glass for the opening of the Contemporary Art + Design Galleries in March 2015.